Falls are one of the most common injuries that can lead to serious health issues and unfortunately many of these falls happen in the home. As we age, our mobility and dexterity can diminish leaving us unsteady and susceptible to the pull of gravity. Your physical therapist can have tips for older adults & caregivers to help prevent falls. Whether it is a loved one or a patient in our care, observing the environment around the home can help identify possible hazards and potential pratfalls that can lead to a dangerous fall. Being proactive is better than reactive!! Let’s face it, we have all taken a tumble in our lives at one time or another. The real consequences of a simple fall may not become apparent until an elderly relative or patient takes what might seem like a little tumble. What are these consequences? In its simplest terms, as we age not only do we become less nimble, but we may become more and more frail. Our bones can become more susceptible to breakage or fracture, especially in women with calcium deficiencies which can lead to a painful recovery. 1. Comfortex Landing Strip Injury Prevention Floor Fall Mat: While preventing falls is the goal, minimizing damage from a fall is next on the list. 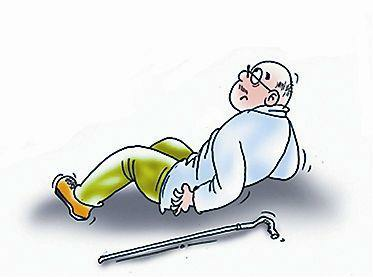 The distribution of force in a fall can help dissipate any impact on a falling patient. Comfortex floor mat is designed to distribute any impact and force from a fallen patient across the surface of the mat. 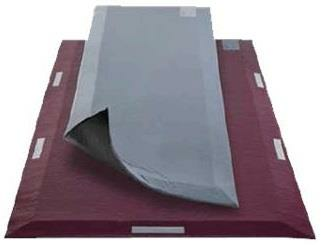 With tapered edges, this mat allows wheelchairs and even IV carts to roll over easily and minimize the risk of tripping. Since this matter is not designed to fold, there is no seam that can be a trap for dirt, a tripping hazard, or even a weak spot for splitting down the road. 2. Non-skid Shower Slippers: Bathrooms and specifically the shower can become a fall risk when tiles in these rooms get wet. Our skin is not an ideal material for gripping this wet tile surface at all!! 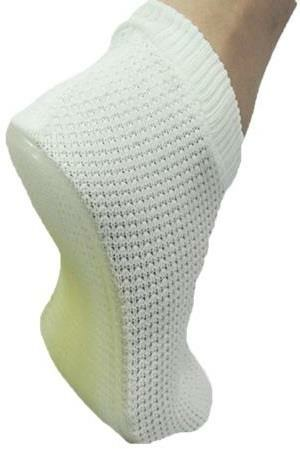 The non-skid shower slippers not only offer an upper loose knit nylon design to allow water in to keep feet clean, but they have a latex-free rubber sole that gives a nonskid surface for those that are at an increased risk for falling. Enjoy your shower/bath and be safe at the same time!! 3. Carex White Wall Grab Bar: Sometimes patients at risk for falling only need a little bit of assistance to sturdy themselves. Whether it be showering or using a commode, the Carex grab bars can be positioned in and around the home in order to allow patients at risk of falling a point of contact to stand from a seated position or vice versa. The durable heavy-duty tubing is finished in an attractive white powder coat finish and should be installed by a professional since its effectiveness is directly related to the proper installation of the bar. 4. Clarke Handi-Grip Single Handgrip Portable Grab Bar with Suction Indicator: Preventing falls on the road and some patients don’t want a permanently attached grab bar and these grab bars solve these dilemmas. 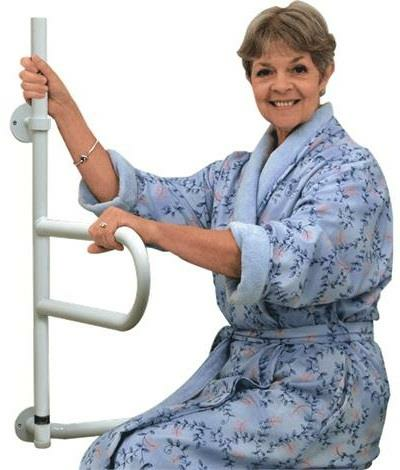 These Clarke Handi-Grip grab bars are made of two suction cups with the release levers and create a strong suction to adhere to most smooth surfaces easily. The bar and suction housing are made of high tensile plastic, while the metal parts are stainless steel with the suction pads made from natural rubber for high-quality construction and durability. Perfect for marble or tile that may be damaged due to drilled holes; these can actually be taken on trips so you can be secure on vacation. All that is needed is a minimum area of 5”x5” in order for the suction cups to be used safely. When the red edge of the safety cup shows, simply release and reattach. Easy peasy!! Since not all tile is nonporous and flat, always check to make sure the bar is attached firmly before using. 5. 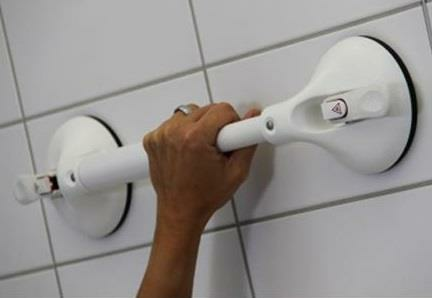 HealthCraft Dependa Grab Bar: The shower/bathtub can be the most dangerous area for falls in the home. For those with limited mobility, getting in and out of the bath (especially when wet) can be hazardous. Dependa grab bar is mounted to structural studs and offers a combination of a standard wall-mounted grab bar as well as a horizontal pivoting and locking bar. This pivot and lock technology keep the support in front of the user which allows for pulling and leaning on the horizontal bar making avoiding falls in the bath safe and easy. This bar system can be installed by the bathtub/shower or even near the commode and can support up to 325 pounds. 6. Guardian Deluxe Tub Grab Bar: Safe entrance and exit from the tub can be dangerous for those that are at risk of falling. Guardian grab bar can fit tub walls ranging from 2.75”-6.25” (7-16 cm) wide and have a weight capacity of 250 pounds. The large rubber pads of this grab bar will not mark the tub and can be installed without tools and allow for unobstructed entry and exit to the tub while allowing for better hand positioning due to the bi-level handgrip. Being proactive in making the environment around those who may be susceptible to falling is a great way to minimize the risk of falling. We use our bathrooms in particular to maintain our personal hygiene, but this room in our house can become dangerous to those with diminished mobility and stability. Your physical therapist can help recommend and design the proper safety items you may need in your home to minimize the risk of falls. Be proactive and maintain your quality of life while minimizing any risk of injury! !